Each year, August 18 marks the anniversary of the ratification of the 19th amendment to the United States Constitution. While female politicians are not a rarity to today’s society, less than a century ago women did not even have the right to vote in the state of Connecticut. Since receiving the right to vote in 1920, women in Connecticut and the United States have seen their rights as citizens evolve and change greatly. 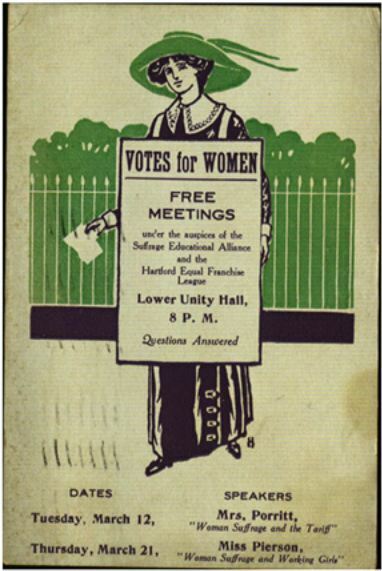 In 1869, the Connecticut Woman Suffrage Association (CWSA) became the first official organization to fight for suffrage (the right to vote) in Connecticut. By 1910, the women’s movement in the state had experienced increased activity and the numbers of individuals supporting woman suffrage continued to grow. Like the suffragists before them, this new generation of women argued that equal participation in government was a natural right, and they showed interest in a wide range of issues including child labor, prostitution, political corruption, and fair work regulations. 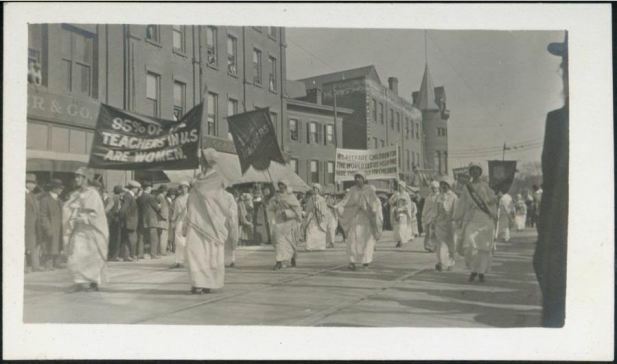 The CWSA, along with other Connecticut-based organizations, regularly submitted bills and testified at legislative hearings demanding equal rights and made its members’ commitment to suffrage known by organizing national demonstrations. 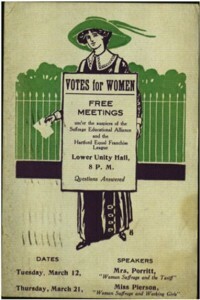 Through the cooperation of various groups and individuals, the state of Connecticut helped promote woman suffrage for the nation. After years of demanding equal suffrage, women won the hard-fought struggle to vote in Connecticut and across the United States. This November female voters can remember that they owe their right to cast a vote to the suffragists who preceded them. Jessica Jenkins curated the 2010 exhibition on women’s suffrage at the Connecticut Historical Society and is currently the Curator of Collections at the Litchfield Historical Society.